Please join me in supporting BC Children’s Hospital. 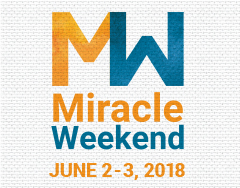 BC Children's Hospital Miracle Weekend, which will take place on June 1 and 2, 2019, is a celebration of hope, courage, and remarkable people who are making a difference for BC Children's Hospital. I believe every child in BC deserves the best chance of a healthy future. That’s why I’m excited to support Miracle Weekend as a Miracle Maker and raise money to provide the best possible care to children across the province. Please join me in making a difference for BC kids by making a donation in support of my fundraising efforts.